'Improvements in the arrangement and combination of the parts of Loco Engine', dated 22 December 1841. Engineering plans, elevations and sections drawn by J Farley of Guilford Street, London, and signed by Robert Stephenson. 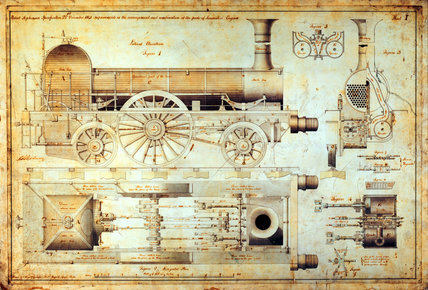 This engineering drawing shows a 'Long-boiler' locomotive typical of the railways of the north-east of England in the first half of the 19th century. Robert Stephenson (1803-1859), mechanical and structural engineer, was the son of George Stephenson (1781-1848), whom he assisted with the survey of the Stockton & Darlington Railway. Robert attained independent fame with his designs for (among others) the Britannia Tubular Bridge and the Royal Border Bridge at Berwick (both constructed in 1850).